First of all, this is not a post about knitting. Really. It’s a post about life. We all deal with life, right? So you should find something that will apply to you (unless you never have dreams or plans, or maybe you have them, but you never screw them up along the way). If you deal with life and you happen to knit, bonus. I’m a seasonal knitter. Basically, I let the gardening season dictate my knitting season: if there’s gardening to be done, and the days are still long and mild, you will NOT find me knitting. After the first frost, I put away my gardening gloves and unpack my knitting needles. My first project of the season is generally something small that I make for myself, before I start knitting holiday gifts. This year I ordered some new shades of my favorite baby alpaca yarn and decided to make myself a hat—a stripey, soft, warm hat. As my “tweets” below (in bold) indicate, I had some problems along the way. In my attempts to not make myself crazy as I tried righting the wrongs, I became all philosophical about how knitting is like life. Nov. 10: walked to cafe. brrrr. must finish knitting my hat. not that I don’t have a hat, but a new baby alpaca stripey one will make me very happy. In this initial stage, you recognize a need: Something’s missing in your life. In my case, it was getting cold, and I envisioned the very thing to warm and cheer me: a new hat. I romanticized how I would sip tea and listen to Nick Drake, knitting my evenings away while Jason sat nearby reading snippets of the New Yorker aloud to me. I imagined how easy the project would be, and how satisfied I would feel (and how great I would look) when I wore it. Nov. 15: finished making the stripey baby alpaca hat, but the decreases aren’t quite right. I properly adorned apple cake w cream ch frosting, tho. Hmm…at this stage, you’ve met your goal with relative ease. It didn’t turn out quite like you envisioned, though. Not ready to face the problem, you set it aside and turn to some other task you know you can conquer. My finished hat looks really cute—until I put it on and see its goofy cone-head effect. Maybe I can fix that by getting it wet and blocking it…or maybe create a seam to help control the problem…. I think I’ll put the hat away and go frost my cake instead. 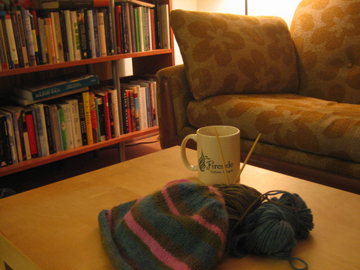 Nov. 16: wrote a blog post to avoid sitting on the couch, near knitting (ie: the hat I finished that doesn’t look quite right & needs to be fixed). You know, deep down, that there aren’t any quick fixes. The problem needs to be dealt with properly, but you’re not quite sure what that means. Plus you’re still feeling bruised and emotional about the whole experience, and you know you would start crying if you faced it. Distraction is the perfect antidote, so I avoid the living room where my knitting bag sits, and instead spend the evening at the dining room table, busying myself with something I have more control over: writing a blog post. Nov. 17: ripping out rows of knitting gone wrong can be exhilarating or excruciating, depending on your state of mind. much of life is like that. When you’ve had a couple of days to get over your disappointment, and you’re feeling stable because pretty much everything else in your life is going OK, you’re in a good place to grab the bull by the horns, so to speak. I’m not so sure how I’m going to ultimately fix my hat problem, but I know the first step is ripping out the last 20 or so rows of stitches. There’s no getting around it. Once I accept that and begin to pull on the tail of yarn, watching everything come apart, round and round in circles, it’s really pretty darn satisfying. It was all wrong, after all, and I’m not about to leave it that way. I rid myself of the mistake, so I can start over. There’s something very humbling and scary about starting over. You realize the way you went about it before isn’t going to work—you have to try something completely new. But what? You already put your faith in one set of instructions, and they failed you; how will you know which ones to trust? I look in lots of knitting books, at many hat patterns, trying to figure out which set of decrease instructions sound right to me. I think and think about it, but eventually I have to throw myself into it and just try something. As I plunge ahead, I know that if I don’t get it right this time, I might never make another attempt. The whole endeavor would most likely get trashed, or shoved into the back of some drawer or closet. Nov. 22: I’m wearing my fabulous new stripey hat and cooking huevos rancheros! When it’s all said and done, and the finished product is yours, your love for it is more fierce and textured and real because of all you went through to get to that point. There are stories and lessons woven right into its very being. As I weave the final tail of yarn through the stitches, taking them off the needles and pulling the crown to a neat, flat finish, I am pleased beyond belief over this humble little hat I just made. When I put it on my head, feeling its gentle warmth and snugness, and Jason admires the two of us, I glow. I’ve been wearing it almost constantly ever since. I absolutely love this post! I’ll be combing your archives later tonight to see what else I can find! Becky, you are too sweet and prone to the loveliest form of exaggeration (but you must somehow know, all the way over there in England, how much I need the positive feedback this week). Thank you for sending some my way. Wish I could have been there for margaritas. I loved this! I could totally relate, and you had each step sorted out so cleverly. We all benefit from your ability to look at yourself honestly and with candor and wit. I think this is worth passing on to most of the women I know! Have you read the Friday Night Knitting Club? Its parallels with knitting and life are similar to the tone of this post. Dorie, isn’t it funny? Not only does life imitate craft, but we find we have the same particular weaknesses in on as in the other. Good luck facing all that you’re avoiding! Mom, you’ve taught me much of what I know about both craft and life! And there aren’t many adjectives I could appreciate more than “candor” and “wit,” when it comes to complimenting my writing. Thank you. Daisy, no, I haven’t read it, but I will be sure to put it on my library list. Thanks for the recommendation!